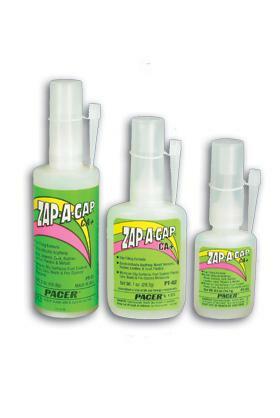 Excellent Gap-Filling Super-Glue Zap-A-Gap 1 oz bottle from Pacer Glues. Retail $8.39 SAVE 30% ! This is a great glue for many uses. Ive used it to fill in dimples on a engine I was building for a kit and worked great. Bonds anything, even oily surfaces! Works best on: Metal, Wood, Rubber, Pottery, Most Plastics, Aluminum, Ceramic. I started using this a few years ago. It sets up nice and is great for filling in small seems. I&apos;ve all but given up using the old tube glue for building models. It does go bad over time. I&apos;ve been told that storing in in the refrigerator helps. i bought some glue from the store it was cheap and messy.The zap a gap was a little more but it is worth it dries in seconds and no mess.I will defintely buy again.